Surname distribution maps are an excellent way of showing where people with a particular surname were present at a given point in time. Two or more such maps for different years give an indication of changes in surname distribution. 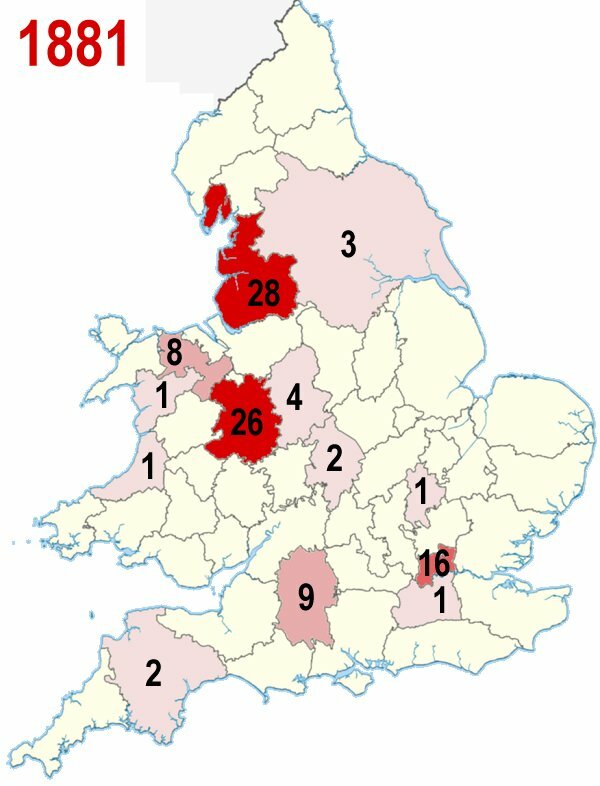 To kick off this new category of Atcherley resources, I have created three maps showing the known distribution of people with the surname Atcherley in the counties of England and Wales and the frequency with which they were found in each county. The first two maps, for 1841 and 1881, are based on census data for those years. The third map is based on my ‘census substitute’ for 1921. This map, based on data extracted from the 1841 census of England and Wales, highlights the heavy concentration of Atcherleys then present in the county where the surname originated: Shropshire. Atcherleys were recorded in only 6 other counties, with the largest numbers in Middlesex (which included London) and Lancashire. See also: Census etc: 1840s. This map, based on data extracted from the 1881 census of England and Wales, shows that although Shropshire was still an Atcherley stronghold the number of people with the surname in that county had more than halved since 1841. More Atcherleys were recorded in Lancashire when the 1881 census was taken, and the total number of counties in which the surname was present had increased from 7 to 13. Middlesex remained a reasonably popular place for Atcherleys, Denbighshire was inhabited by descendants of the first David Francis Atcherley of Marton, and Swindon in Wiltshire had become the home of Edward Richard Atcherley and his expanding family. See also: Census etc: 1860s / Edward Richard Atcherley: A new start in New Swindon. Over the 40 years between 1881 and 1921, the decline of the Atcherleys in their county of origin continued. 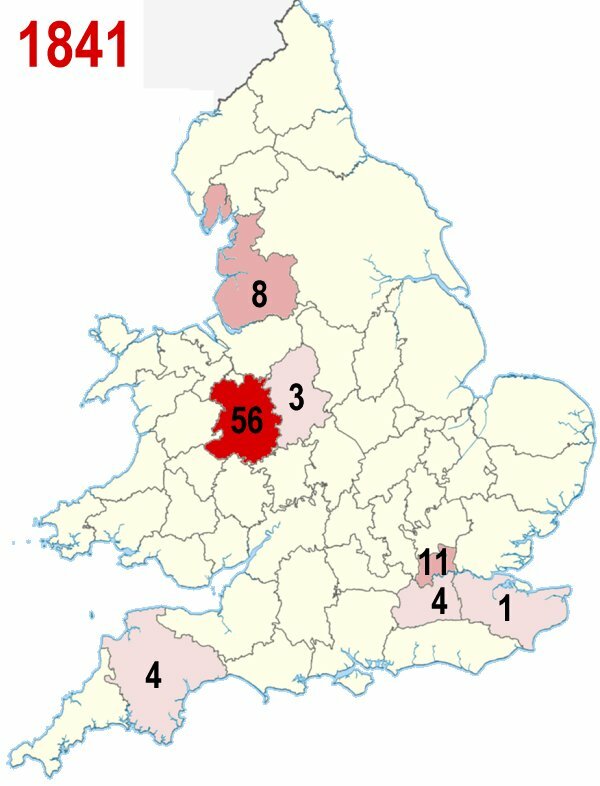 The number of people with the Atcherley surname also declined in Lancashire and the London area (London having become a county in its own right, taking in parts of Middlesex, Surrey, Kent and Essex). 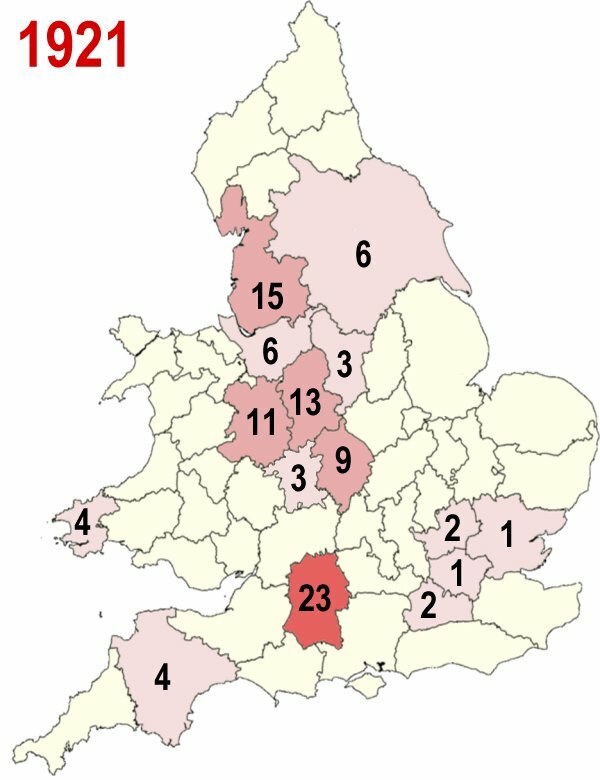 Increased numbers of Atcherleys in Staffordshire and Warwickshire (and their appearance in Worcestershire) by 1921 reflected the draw of Birmingham and the ‘Black Country’. Wiltshire meanwhile had become the county with the largest number of Atcherleys, thanks to the descendants of the above-mentioned Edward Richard Atcherley. See also: Census etc: 1920s.